The weather in Kazakhstan this morning was 78° F and not windy. 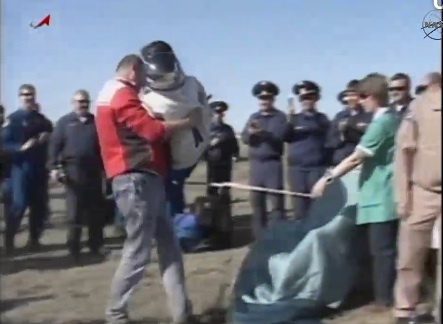 I watched live video of the capsule under parachute for about 7 minutes, then the photographer lost his angle. The parachute pulsed like a jellyfish. I'm not sure why. I think it would be like riding in the car with a pedal-patter though. Surges of acceleration. Pretty unpleasant after almost 6 months in zero gravitational acceleration. I watched all the live video until they took Nespoli, Kondratyev and Coleman to the medical tent then they started doing video replays. They just showed video replay of the actual touchdown shot from one of the helicopters. It was pretty spectacular. A flash and a giant cloud of dust billowed up. Not sure if the dust was from the retro rockets or the impact. It was a VERY short flash. I tried to do a screen shot. I missed the flash from the retro rockets. The helicopter landed pretty quickly after that. 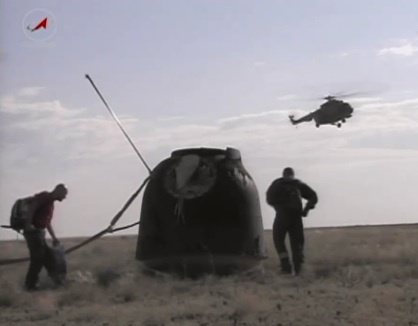 How do you like landing in the Soyuz? Who's the guy in the butcher's outfit? Next Cady Coleman got out. She seemed chipper. The crowd all laughed when just one man carried her by himself. I don't see what's funny about it. Seems the only appropriate thing to do. A two-man carry would have insulted the women of America and the men of Russia. 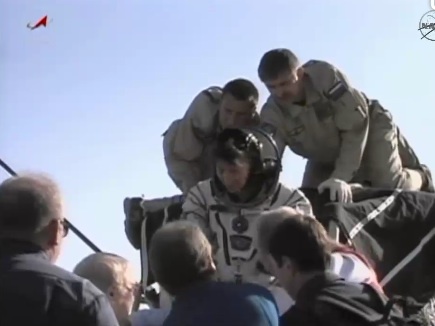 Paolo Nespoli was the last to get out. I think he was feeling a little ooky. 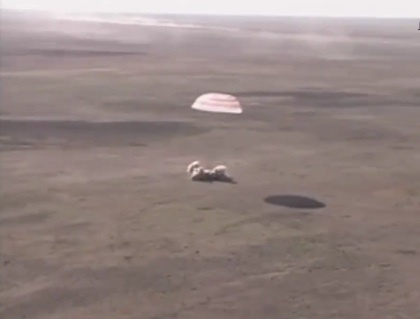 They did bob around under that parachute a long time. Motion sickness was bound to happen, first time in gravity again and everything. Plus he's a lot taller than those other two. He was probably intensely uncomfortable for a long time. So they didn't really show pictures of him like they did the other two. That was polite. Even this brief view of his back you can see he's slumped over and not perky like Cady was. 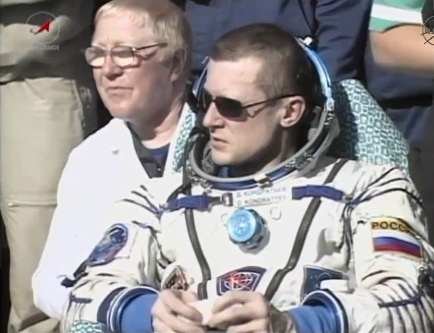 They continued to show footage of the American astronaut and the cosmonaut for a while. Somebody brought Cady some flowers. She was excited to smell them. She said she hadn't smelled anything in a long time. They also took turns with the satellite phone talking to their relatives back home. I think it's worth mentioning that while Dima Kondratyev looks like a badass, Cady Coleman is like Buffy the Vampire Slayer badass. 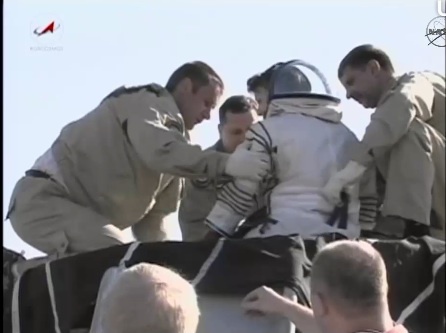 Next the onlookers carried them in their chairs to the medical tent and NASA TV started replaying recorded video, which I started with at the top. I took some more screen shots of the replay because I thought it was interesting how they got that little deck thing on there. It reminds me of an accessory for an above ground pool. 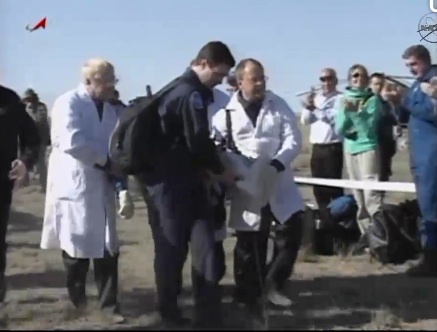 Here's the capsule by itself just a few minutes after touchdown. It was about like my ladder levelers back home. 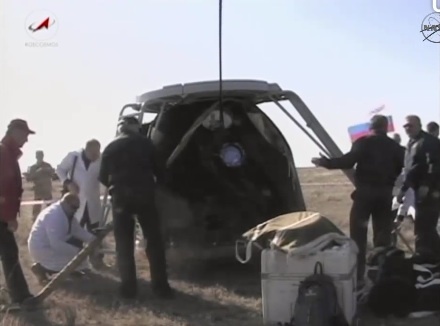 They didn't appear to chock the capsule to keep it from tipping or anything. They tugged on the parachute to get some slack in the lines. 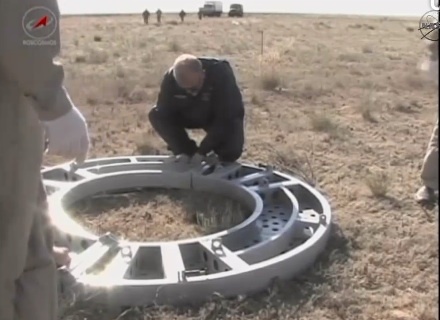 Then they just put this over the hatch so they could reach down in there from a stable platform, unbuckle their harnesses and then pull them out. 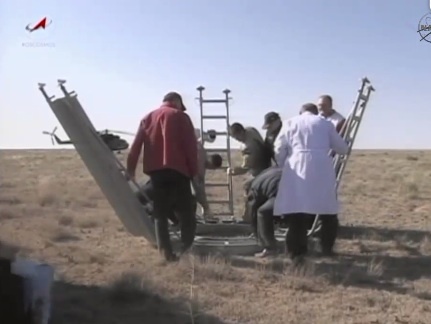 I understand they take the capsule back to the lab and study it for performance and whatnot. It's a pretty long way from civilization. I guess they drive a truck with a forklift out there. 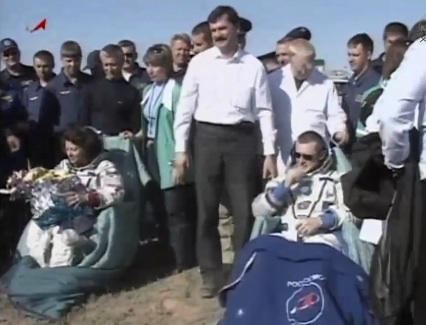 It's a two hour helicopter ride back to wherever they go for the welcome ceremony after they change out of their space suits in the inflatable medical tent. Then Nespoli and Coleman get on a plane and fly to Houston right away. I bet they sleep on the plane. When I was at the Johnson Space Center a few weeks ago I noticed the American astronauts have a pocket in the leg of their suits with a dose of motion sickness medicine in it. I wondered if it was for a water landing? For the life raft? Or maybe for this sort of thing. 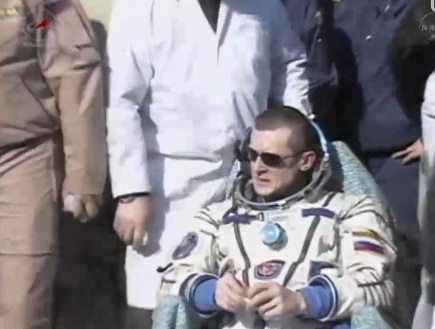 Do the Russian suits have those too? Maybe Cady and Dima took theirs and Paolo didn't. Maybe he was too wedged in there and couldn't reach that pocket. It's way down on the ankle of the American suits. Anyway, I'm glad they made it back. 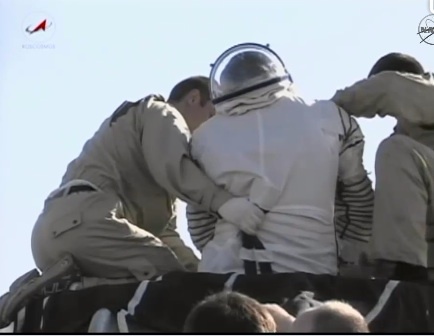 That Soyuz landing makes me nervous. *Update already, here's a link to a nice picture of that touchdown. *Update Wednesday, here's a photo of the instant the retrorockets fired. NEAT! Thanks @Cmdr_Hadfield via @astroengine! 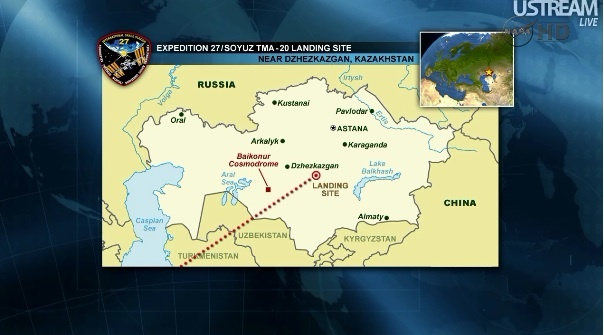 I feel my own teeth rattle with the Soyuz touchdowns. To me, every one of them seems like a controlled crash! 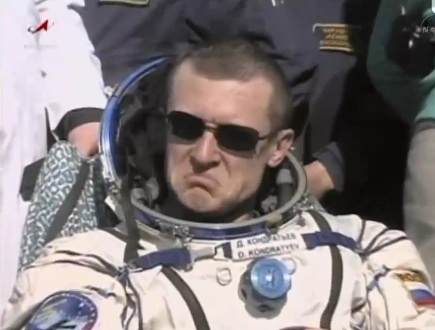 If I had been in zero g accel for six months and hit like that, I'm pretty sure my comment would be on the order of, "Wow, that really sucked." I missed this one, so nice to see the screen captures and other photos. Paolo looked very weak and sick. He tried to put on a brave face, but just appeared totally wiped out, poor guy! I really enjoyed that retro rocket photo, too. It's a beauty!